Unfortunately, certain people cannot get any luck in their lives: be it with their work – be it with their relationships – or be it with their ventures either. And funny enough, the same thing can be said for the characters in this film, one Directed by Sidney Lumet; and Staring: Al Pacino, John Cazale, and Charles Durning. It was made in 1975, and lasts for 125 minutes. Sonny Wortzik (Al Pacino) is a right plonka. And do you want to know why he is a right plonk? Well, in haste to rob a bank situated in Flatbush, Brooklyn, a number of things seem to go amiss one after the other after the other. Firstly, one of his accomplice’s, Johnny, leaves the scene due to nerves. 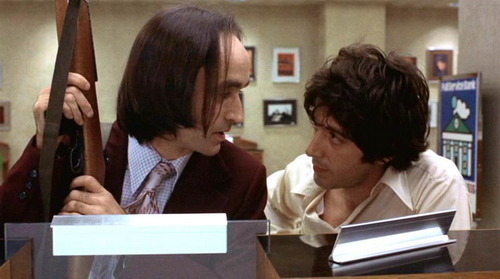 Secondly, Sonny’s other accomplice, Salvatore Naturile (John Cazale), is simple in the head. Thirdly, the security guard whom is supposed to be looking after this bank, collapses. Fourthly, the hostages in the bank are deterred from this strange turn of events. And fifthly, due to chance of fate, the outside world takes note of this robbery, prompting news crews to arrive plus the police to be involved as well – most notably, Detective Sergeant Eugene Moretti (Charles Durning). Therefore, this robbery turns into a siege. Get it! Prudently, Sergeant Moretti tries his best to coax Sonny out of the bank, so they he can then end this situation more diplomatically. However, Sonny has some of the hostages and an emerged baying crowd by his side, which inadvertently encourages him to stand his ground and then hold out for what he came for – cash. And does he get the cash? Hmmm? No – not at the moment – he gets pizza for the guard – plus a whole host of problems to boot. You see, as time passes, Sonny’s predicament turns even more dire, because his real reasons for stealing the cash are suddenly revealed – thanks to a ‘close friend’ of his called Leon Shermer (Chris Sarandon). In addition to this, Sonny’s wife and mother try to talk him down without even listening him. Worst still, the manager of the bank collapse because of his diabetic condition, causing Sonny’s world to turn upside down. F*cking hell, how is Sonny going to get himself and Salvatore out of the bank and with the cash, huh? A plane trip perhaps? No – not to Wyoming – but maybe to sunnier climes instead. Hmm? Maybe FBI Agent Sheldon (James Broderick) can help with this? Hmm? Well, I am afraid to say what then transpires is a really intense set of circumstances all in all – as wills are eulogised – trips are planned – hostages scared – and Sonny and Salvatore are shocked by how all of this plays out, BANG! 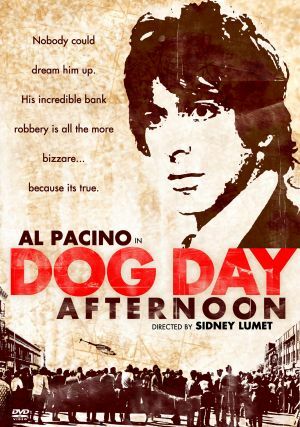 Nothing is said in the first few minutes of ‘Dog Day Afternoon’ – it is just a slow and steady burst of scenes which relays that something is coming up next. Then suddenly, as if by magic, BANG! The story fumbles into play, and you can just feel that this is going to be a great film – and it is. OK, I have to admit, that this is what I first felt when I watched this seventies masterpiece, because the story, the characters, and the whole ambiance of this movie, just captured my imagination as no other film has done before it – except for maybe ‘Dr Strangelove’. In fact, I became so enamored with this film, that I even tried to write a story evolving around the whole pretext – a robbery turning into a siege. However, me being me, I added a supernatural element into the mix, whilst at the same time swapping a robbery in the bank with a robbery in a morgue. Unfortunately, at the moment, nothing has really come from my writing excursion. Still, this film has proven to me that this is possible. And why does it say that to me? Simple really – the bases of this film is steeped in truisms, and because of such, it also goes to show that sometimes truth is more stranger than fiction. Fair enough, having a great cast like Pacino, Cazal, and Durning, does not hurt either, as well as the additional players whom really lend something to this film which is truly special. And what could that be? Their wardrobe? As a select few actors were allowed to wear their ‘own gear’ so that they felt more comfortable in their roles (and paid $1 for there troubles too). No – it is not that – as this film is not acted – it is lived, and illustrates perfectly how drama can be captured in a true form without being overtly staged. Actually, while I am on the subject of life, let me tell you a little trivia about this film: (1) This film was based on true events that happened in New York in the seventies. (2) Al Pacino has an uncanny resemblance for the real perpetrator of this crime, John Wojtowicz. (3) One of the hostages in this film, Penny Allen, was in fact someone whom helped Al Pacino in his early career by allowing him to stay with her and her family. (4) The bank in the film was a real-life location not too far from the actual crime. 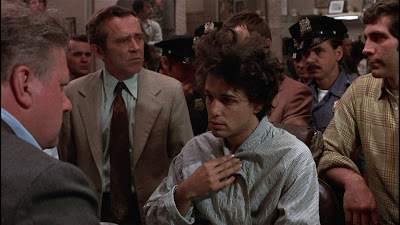 (5) There were a number of improvisations pieces of dialogue in this film that was not in the script – such as the ‘Wyoming remark’ from John Cazale, and the famous ‘Attica line’ from Al Pacino. (6) As preparation for this film, Chris Sarandon dragged himself up and walked through the streets of New York – nobody even noticed. (7) Al Pacino passed up on this film initially because he knew from working with the chosen director previously – Sidney Lumet in ‘Serpico’ – that he was a tough guy to please because of his tough work ethic. Also, he was not too keen on playing a role that wasn’t that ‘butch’. Still, he conceded in the end – thankfully. (8) The real-life bank robber that this film is based on, John Wojtowicz, did not want no part in the making this film – though he did receive some monetary compensation for it. He died in 2006 – 19 years before his partner, Ernest Aron / Elizabeth Eden. (9) There is a scene cut out from this film, though used judiciously in it, where Sonny marries Leon. (10) During the first day of shooting, Al Pacino had a beard to play the role of Sonny. But at the end of the days shooting he felt that it wasn’t right for the part, so he shot this day again the following day. (11) Charles Durning was making another film in Los Angeles at the same time he was making this one in New York – and he was chauffeured back and forth to a pre-arranged schedule. (12) Whilst recording the end sequence of ‘Dog Day Afternoon’, one of the female hostages / actors had a brief bout of Stockholm syndrome, and did not want to leaver her ‘captors’. Well, as you can imagine, I like this film a lot to know so much about it. Heck, I like it so much that I can’t even pick a favorite scene amongst the many presented – though I think that the ‘telephone sequence’ is very compelling. It is a funny film – it is a captivating film – and on top of that, it is a true film! So what are you waiting for you git? Go and pick one up to day! A class film – a class cast – and a class story.